Zimmermann’s status is on everyone’s mind. Photo Unk. I used to love answering the questions that MLB.com beat writer Bill Ladson would post. But Ladson hasn’t done such a column in months, and the other outlet for such a post (Tom Boswell) usually is populated with too many non-baseball questions to be worth addressing. So today WP beat reporter James Wagner took a crack at a Q&A session and I thought it’d be fun to do a version of his Q& (my) A. As with previous posts, I write my response before reading his and edit the questions for clarity/conciseness. Q: What was the Nats’ final record against winning teams & how did it compare to the other playoff teams? A: Wagner summarized the answer well; the Nats ended up 23-23 against winning teams. To show you how useless this stat is in predicting the playoffs, the team with the best record (the Orioles) was swept and the WS matchup features the Giants, who had a losing record against winning teams. Once again we learn that the post-season is about getting hot (or in the Nat’s case, disappearing) at the right time. Wagner did the same analysis. Q: Will the Nats turn to Tyler Clippard as the 2015 closer? A: Doubtful. Despite Drew Storen‘s second playoff meltdown, he’s likely the closer in 2015 on the strength of his excellent 2014 season. Tyler Clippard‘s of more use in generally higher-leverage 8th inning situations, and likely continues in that role. This has to be a bummer for Clippard, who enters his last arbitration argument without the benefit of the lucrative saves, but who is also just as likely to cash in when he hits free agency with a team looking for a reasonably priced closer. I’ll bet he can get a 3yr/$24M deal as someone’s closer. He is a fly-ball guy (not optimal as a 9th inning solution) but fly-ball pitchers definitely play well in pitcher parks. He’d make an excellent closer for most any team on the west coast. Wagner agrees. Q: Why not keep both LaRoche and Zimmerman and platoon them at first base? A: Because that’s an awful lot of payroll to dedicate to a platoon. LaRoche likely gets $15M/year, Zimmerman is set to earn $14M next year. Both are middle-of-the-order bats who need to play every day. Unfortunately we don’t have a DH, else you’d re-sign LaRoche immediately and they’d split time at 1B/DH like most every other DH in the AL. LaRoche is getting one last crack at free agency and could get another 2 year deal (rumors have him as a great fit in Milwaukee). I think sticking Zimmerman at 1B makes the most sense considering the description of his shoulder at this point (he used the phrase “bone on bone” to describe the state of his arm at this point). In fact, I think Zimmerman makes a great first baseman, immediately becomes a Gold Glove candidate, and (hopefully) stays healthy. Wagner makes the same points. Q: How about Steven Souza as our 2B solution? A: Souza started his pro career as a third baseman … and was moved to the outfield by the time he was 22. I’m guessing there’s a reason for that. I don’t see him coming back to the infield, either at 3b or 2B. He’s way too big to play second base effectively (he’s 6’4″ 225); if I was forced to play him in the infield, i’d suffer with him at 3B and stick Rendon back at second. But that’d be a waste of Rendon’s defensive talents at the hot corner; we’re much better off installing him at his natural position and finding another 2B alternative. None of this really talks about what the team *should* do with Souza; he’s more or less blocked for 2015 (as we’ve discussed to death) but has nothing left to prove in AAA. His best case scenario is an injury in the Nats 2015 outfield, which gives him playing time. Wagner points out Souza’s poor defensive record in his time at third. Q: Should we care about the MASN outcome? A: Uh, yes. The Nats could easily expand payroll with a decision and a guaranteed income stream, and we’d not be hearing about how they “have to” let some of their core players walk because they can’t afford them. The MASN issue has gone on way too long, and it seems like it is getting ready to affect both the Nats and the Oriole’s business operations soon. Wagner agrees. Q: Do players and broadcasters read blogs and the press? A: I hope not. We’re not professionals; we don’t have day in-day out access, intimate knowledge of the team’s comings and goings, nor insight into reasons that may be behind a player’s cold streak (does he have the flu? Is he nursing a slight sprain that nobody knows about?) I don’t think any good comes of professional players reading about themselves. If a player called out something I wrote derogatory i’d probably profusely apologize and retract it. Wagner says players sometimes read about themselves in the press … but that if they don’t, they’re likely to hear about it from family/friends/agents anyway. Q: Which of the bench players (Frandsen, Hairston, Schierholz, McLouth) will be back and who will most likely leave? A: Well, McLouth is still under contract for 2015, so he’ll at least start the year with the team (whether he finishes depends on whether he can regain some value). I’d guess that the other three are gone. None of the three hit particularly well for us, and all three are replaceable by internal promising candidates. Frandsen probably has the best chance of sticking around since he’ll be so cheap (he made $900k last year and is arb-eligible); he’ll be an interesting tender-deadline candidate. Your 5-man bench needs a catcher (Lobaton), a guy who can play both 2b and SS (Espinosa, if he’s not the 2B starter), an outfielder who can cover center (McLouth), a utility guy who can play multiple positions (Frandsen fits here), and then a big bopper who can pinch hit. This last spot has been held by the likes of Tyler Moore, Chad Tracy, Matt Stairs, Jonny Gomes in the past few years. In 2015 it makes more sense to have Souza in this spot. Only problem is that it helps if this last bench spot is a lefty. We’ll see how the transactions play out this off-season. Q: If you must chose between Zimmermann and Desmond, whom do you chose? A: Desmond. Harder position to fill, less in the minor league pipeline, probably cheaper too thanks to Desmond’s sub-par (for him) 2014 season. Zimmermann seems likely to earn nearly $20M/year at this point, which is going to be too rich for this team, and there’s ready-made replacements in the upper minors (A.J. Cole, Blake Treinen, Taylor Jordan) ready to step in immediately after he departs. A better question might be this: do the Nats flip Zimmermann this off-season for something better than a compensation pick, admitting to themselves they won’t be able to extend him? It makes 2015 team weaker obviously, but also could ease the transition to the next “phase” of this team that starts in 2016-2017. Wagner agrees, but also mentions that Doug Fister plays into this decision too. Q: If the Nats make it back to the postseason next year, can you envision them carrying a speed first guy like Rafael Batista or Wilmer Difo on their roster a la the Kansas City Royals? A: No. Williams is old-school and made it pretty clear that he was managing his post-season team the same way he managed his regular-season team. For better or worse. The makeup of this team isn’t the same as the Royals, who have focused on speed, defense and bullpen strength to power their way through the post-season. The Nats are a starter-first, adequate but fragile offense second. Wagner isn’t as dismissive as I am. Q: Why not find a FA third baseman and move Rendon to second? A: A completely logical idea that we’ve talked to death. Definitely on the table. Wagner puts out some names that likely are going to be too expensive for the Nats to really consider. Q: If the Nats offered Zimmermann a big extension and he declined it, could you see the Nats trading him? A: If I were the GM, I’d consider it yeah. You take a step back in 2015 to set yourself up for 2016 and 2017 with the right deal. Maybe you flip Zimmermann for the 2b/3b player you need and a prospect or two further away, save some payroll and provide more continuity. My reading the tea leaves though? I don’t see this team doing it; they’ll “keep the band together” for one more run with this crew in 2015, and then make adjustments for 2016 depending on who they can sign and who walks. Wagner thinks its possible, but also cautions that the 2015 salary ($16.5M) and just one year of control will limit what the Nats get back. A very fair point. Well, we finally got a manager, so hopefully MLB.com Nats beat reporter Bill Ladson will stop taking “Who do you think the next Nats Manager” questions. I’m not ruling it out though Nonetheless, here’s the latest Ladson inbox, dated 11/5/13. As always, I write my response before reading his and edit questions for clarity. 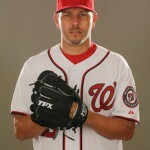 Q: Will Davey Johnson still play a role in the organization? A: Who cares? Does it matter? Whatever role Davey Johnson could play would have so little significance on the on-field play of the 2014 team that I find it useless to even speculate. I’m sure the Nats offered him a limited role out of respect, and I’d assume Johnson accepted it as long as it allowed him to go relax in Florida for a while, hoping another managerial job opens up. Ladson expects he’ll consult to the team and advise on trades and FA signings because he’s such a great “talent evaluator.” Hey Bill; if Johnson was such a great talent evaluator why exactly did he run Danny Espinosa out for so many at-bats? Why didn’t he push to make a change in the rotation when it was clear that Dan Haren wasn’t pitching at even a replacement-level? How come he didn’t see the rising talent that made such a difference in September? 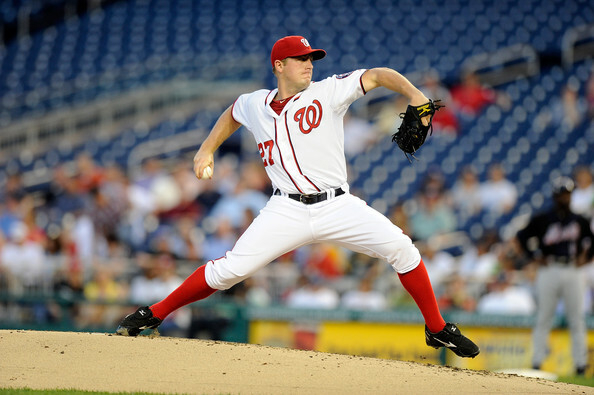 Q: After Stephen Strasburg, Gio Gonzalez and Jordan Zimmermann, how do you see the rest of the rotation shaking out? A: A good question. After going into the 2013 season with almost no high-minors starting pitching depth, you have to think the team is going to cover themselves for 2014. So count on there being more seemingly worthy candidates than roles going into spring training 2014. The answer to this question may depend on payroll issues: right now Cots has the Nats with about $80M committed for 2014 prior to its arbitration cases, which MLBtraderumor’s Matt Swartz is estimating will run the team another $37.3M (which honestly I think is slightly low). That’s roughly $117M in payroll before even looking at a single FA candidate. You could save some of this money with non-tenders or trades (Tyler Clippard at $6.2M is a candidate to be moved), but not enough to get an impact player. Will the ownership group expand the payroll even more for 2014, knowing their “window” with this group of players is shrinking? Or will they stay the course and know that nearly $30M of mostly underperforming veteran FAs (LaRoche, Span, Soriano) come off the books after next season, allowing them to reload in the FA market towards 2015 and beyond? If ownership frees up some cash, by trade/non-tender or by expansion of the payroll limit, there are FA pitchers to be had. I’ve seen more than one pundit with the Nats linked to Matt Garza, but I don’t see it; I don’t think he’s worth what people seem to think he’s going to get (4 yrs/$60M). More likely is the team going with a modification of the Edwin Jackson/Dan Haren plan and getting a reclamation project in the ilk of Josh Johnson on a one-year/low paying contract with big incentives. Less predictable is the trade acquisition. Nobody saw the Gio Gonzalez trade coming until it happened, and something similar could happen now. The team is in the same position generally this off-season as it was in 2011 in terms of having a slight surplus of closer-to-the-majors arms and bats and could put together a similar package. If we moved Brad Peacock, Tommy Milone, Derek Norris and A.J. Cole for Gonzalez in 2011 (or in otherwords, a good-looking starter with great initial call-up numbers, a solid lefty starter who dominated AAA, a decent looking catcher prospect and a high-leverage low-minors prospect) would a similar package of something like Tanner Roark, Nathan Karns, Eury Perez and Robbie Ray fetch a #2 starter in the trade market? Oakland isn’t facing the same issue they were in 2011 with any of its pitchers, so the most likely eager-to-make-a-trade GM in Billy Beane is out. But that being said, they’re paying Brett Anderson a LOT of money for Oakland’s payroll (roughly 1/6th of their payroll for next year), and he could be moved. Anderson wouldn’t cost nearly this much in prospects, but would be a huge risk; he hasn’t pitched a full season in years. Meanwhile everyone knows Tampa is looking to move David Price, but any trade for him has to start with your two best prospects and build from there, and the Nats are just back to the point where the farm system is looking respectable again. I’m not sure the Nats are going to be willing to give up what the Rays will demand. The Nats have done business lately with the Chicago Cubs, who may look to move the arbitration-eligible Jeff Samardzija, but they’d be selling incredibly low on him after his poor 2013. Lastly the Tigers reportedly are considering moving Max Scherzer, who enters his last year of arbitration looking for a big pay day and with Ken Rosenthal reporting that the Nats are his best fit, but I just cannot see purposely moving a Cy Young winner and disrupting a team that continues to be one of the best in the AL. With no FA acquisitions and no trades, I see a competition next spring that likely sees Ross Detwiler in the 4th spot (no options, theoretically healthy again), Tanner Roark in the 5th spot (he keeps his spot until he shows that his remarkable September numbers are human), Ross Ohlendorf as the spot starter/long man in the MLB pen, and Taylor Jordan-Nathan Karns being the #1 and #2 starters in AAA Syracuse. Some speculate that Detwiler would lose out to both Roark and Jordan and become a lefty out of the pen … but I don’t see that. I’m not counting it out, but I don’t see that happening if he’s healthy. With any significant FA acquisition or trade, you line up Stras-Gio-Zimmermann-New Acquisition and Detwiler to start off 2014, just as you did in 2013. Roark and Ohlendorf likely work out of the MLB pen and Jordan/Karns still in AAA. Maybe Karns comes up and works the 7th inning as well, while Jordan remains starter insurance plan #1. Ladson also mentions Price, also mentions what I do about the difficulties lining up, thinks the Nats will acquire someone for #4 spot and then says Roark has the inside edge on #5 spot, even over Detwiler (who he thinks could move to the bullpen). Q: What did you think about the Nationals hiring Williams as manager last week? A: Well, I guess Ladson had to get in one last question about the managerial situation. My take: I like the move, I think Matt Williams‘ combination of successful playing career and MLB coaching experience will instantly give him the respect of the veterans and the rookies on this team. He will get this team in line, he will bring some old-school notions to this team and won’t back down in a fight (as Johnson clearly did with Atlanta all year). I think he will give this team the spine it lacked and will do nothing but help move the team forward. One other opinion; I do see some critics who say that Williams’ lack of direct managerial experience at any level hurts him. I say BS; he was a major league coach for four years, working underneath a successful, respected manager. He presumably contributed to the decision making process, got to witness first hand how decisions worked out, got to decide for himself how he would have handled situations, and in some ways I think this experience supercedes being a manager of a lower-level ball-club where there’s no egos and just a bunch of kids who you can cower into submission. Ladson says its too early to tell, but that Williams had a great news conference. Honestly I didn’t really expect much of an answer here from an employee of MLB. Q: What is Christian Garcia‘s status? 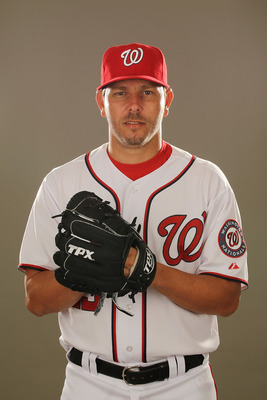 Will he join the Nationals in 2014? He was a great late addition to the bullpen in 2012. A: He’s finally healthy, and pitching in the Mexican Winter League. I think the team sees the error of its ways in trying to convert the injury-riddled pitcher to being a starter. He’s working as a reliever in winter ball, and I hope to see him continue to work as a reliever in the spring. I’d love to see him earn a spot in the bullpen; lord knows the team could use one more reliable arm in the 6th/7th inning (Ryan Mattheus needs to be on guard; your spot is in jeopardy for 2014). Ladson agrees with everything I’ve said. Q: Do you think the Nationals will trade Danny Espinosa, Tyler Moore and Steve Lombardozzithis winter or sign a couple free agents? I believe they need a lefty middle reliever, a left-handed bat coming off the bench and a veteran backup catcher. A: Trading any of those three guys after the seasons they had at the plate would be selling incredibly low. So no, I don’t think any of them get moved unless they’re part of a larger deal. Espinosa needs to get healthy, learn how to hit left handed, and build trade value. I believe he can be a valuable player for someone, somewhere, just based on his incredible defense. But he has to hit better than .150. Moore needs to return to his 2012 power ways, but I still see him as a useful player who we have no reason to trade; he still has options, he’s still pre-arbitration and thus he’s cheap. Lombardozzi is the quintessential utility guy; he can play 2nd, 3rd, left, right. You have to have one of these guys around … and if he can’t hit, it is’t going to kill you. But when this player gets 300 ABs (as Lombardozzi got last year) … then you have a problem. This is why the team got Scott Hairston and why they’re likely to give some looks to Zach Walters in 2014. Maybe the team looks for a cheap veteran to replace Chad Tracy but i’d hope for a bit more positional flexibility. I can also see the team kicking the tires on a veteran lefty but don’t entirely see the need; Ian Krol may have faltered down the stretch but he was mostly good. Abad was good. Cedeno was good. We have all these guys locked up. You see who wins a competition and switch them out if they’re ineffective. Ladson thinks Espinosa is getting traded no matter what, and has played his last game as a National. Q: Are Gold Glove Awards given with consideration to the offensive stats of a player? Otherwise, how could Denard Span miss out on the award this year? A: They’re not supposed to be … but we all know old habits die hard and bit players who are awful at the plate often times have a hard time getting a Gold Glove. Span as it turned out led all NL centerfielders in one defensive metric (Total Zone Total Fielding Runs), but I have zero problem with the NL winner Carlos Gomez. Ladson says he was “shocked” that Span didn’t win, and then used “# of errors” as a metric. Poor form Ladson; you need to reference some of the advanced stats in question. Gomez led the NL in Defensive Runs Saved, one of the two major defensive metrics. So your argument fails. Span may have great range, but he wasn’t best in the Ultimate Zone Ratings measurement either. See the Fielding Awards spreadsheet link to the right to see all the leaders in one place. Now that the WS is over, the official off-season begins. Since a number of key dates related to player movement are based on the end of the world series, now we can officially list the key upcoming dates. This document is also available in the links section to the right-hand side of the blog (see the 2013-14 MLB Off Season Calendar link). I’ve uploaded it to Google XLS. A few of the dates listed here are estimates or based on the day they occurred last year. The XLS has urls to back up some of these dates. Nov 2nd, 2013 Clubs have to re-set their 40-man rosters, moving all 60-day DL players back to active. Nats currently sit at 39/40 with two 60-day DL guys; someone has to get dropped unless the FA’s don’t count against this list. Nov 2nd, 2013 HoF “Veterans Committee” releases ballot. Nov 4th, 2013 (WS end + 5) 5pm: Deadline to make Qualifying offers for your own Fas (average of top 125 salaries or $14.1M for 2014). 5 days after end of WS was 13.3M for 2013. Nats highly unlikely to offer Qos to their two Fas. Nov 4th, 2013 (WS end + 5) End of “Quiet Period.” Teams have “exclusive” negotiating rights with their own free agents during this period. Nov 4th, 2013 (WS end + 5) 5 days after WS ends: Free agent filing period and exclusive negotiating window ends at 12:01 a.m. ET. Free agents can sign with any team. 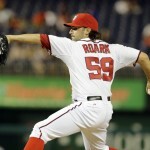 Haren, Tracy only Fas for Nats in 2013. Nov 4th, 2013 (WS end + 5) Free Agency granted to all eligible Minor League free agents (5 days after the end of the WS). Eligibility done on service time; 6 years ML service for college draftees or 7 years ML service for HS draftees or free agents under the age of 18. Plenty of significant, long-serving Nats farm hands hitting MLFA this year. 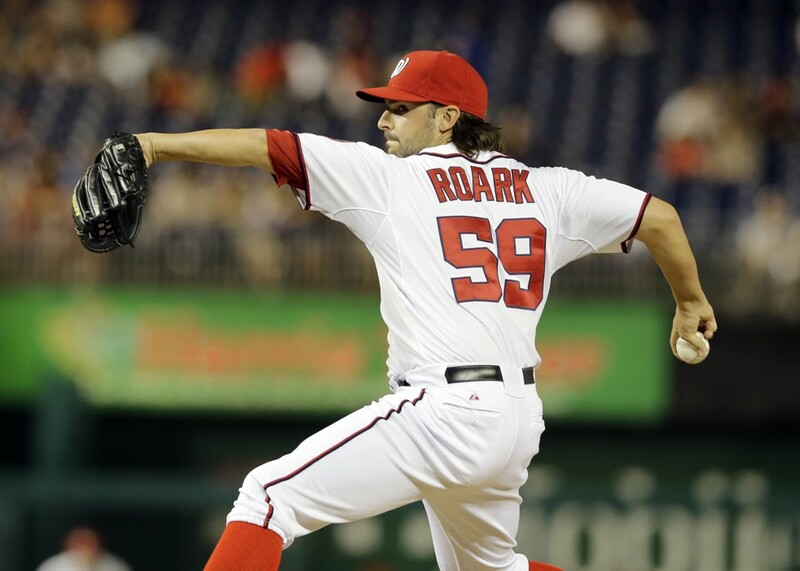 Nov 11th, 2013 AL, NL Jackie Robinson Rookie of the Year Awards Roark get some honorable mention votes? Dec 2nd, 2013 Midnight: Deadline for teams to Tender contracts to arbitration eligible players. If not tendered, those players immediately become free agents. This is the non-tender deadline for arbitration eligible players No real non-tender scares for this year’s arbitration eligible list of Nats. Dec 3rd, 2013 HoF “Veterans Committee” officially releases ballot that was made public ?????? Dec 31st, 2013 Deadline for BBWAA ballots for HoF voting. Jan 9th, 2014 Hall of Fame BBWAA voting announced; the HoF class of 2014. March 13th, 2014 Last day to place a player on unconditional release waivers and pay 30 days termination pay instead of 45 days. March 31st, 2014 Opening Night 2014: ? Vs ? They say success has many fathers but failure is an orphan. Well, here’s a whole slew of orphan-causing problems that befell this team this year. I started this post months ago, when the team sputtered in July and suddenly sat at 54-60. None of these bullet points are surprises. Maybe I forgot some key points; feel free to tack ’em on. This is a cathartic, washing my hands of the 2013 season, where so many things conspired to go wrongly. Davey Johnson, for continued pitching/bullpen mismanagement episode after episode, for seemingly losing the clubhouse (see below), for sticking with severely under-performing players (Espinosa, Haren especially) far, far too long, for failing to react to repeated beanings of his best player, and for generally looking old, tired and out-matched this year at press conference after press conference. This team needs a new voice, a disciplinarian who will command more respect than what Johnson was commanding from this team. My vote is for Matt Williams. Injuries. Every team has injuries; I’m not going to write some simplistic statement that says “well if we had So-and-So healthy all year we’d have won the division.” Look at St. Louis: they’re missing Chris Carpenter and Jaime Garcia basically all year and still won the best division in the game. I think the issue most people will have with the Nats is the way their players’ injuries were handled. 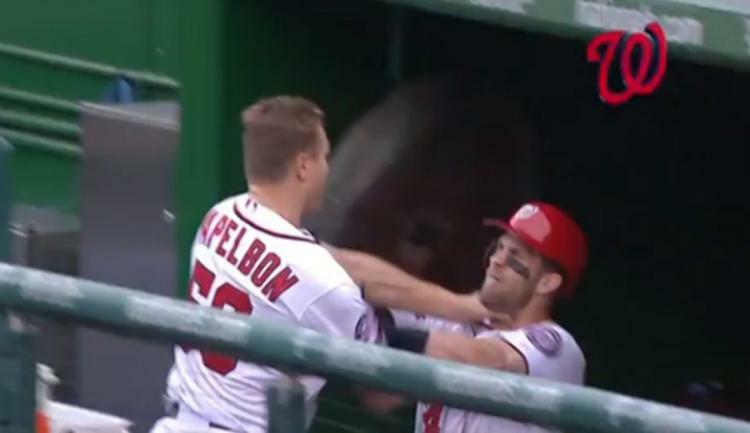 Bryce Harper missed the whole month of June after several wall collisions finally caught up to him and he was clearly in pain the rest of the season. Did the team not allow him to get healthy at the end of April? Meanwhile you have to take serious issue with either the team, Danny Espinosa or both over the handling of his injuries. What good did it do anyone to allow Espinosa to try to play through the significant shoulder injury he apparently has? Why has he STILL not had the surgery done to fix it? It sounds to me like there’s some serious stubbornness on both sides of this fence. Ross Detwiler looked to be on the verge of a breakout season in 2012 … and now he’s back to being the broken down starter he’s mostly been during his time here. In his 6 pro seasons he’s not pitched full seasons in 3 of them. This isn’t necessarily on the team .. but I will ask this: at what point do you go into a season counting on Detwiler to break down instead of the reverse? It goes to proper roster planning (also mentioned later on). Bench production, for regressing so far past the mean from last year’s over production. Did you know that Steve Lombardozzi got more than 300 plate appearances this year with this slash line: .255/.276/.337? I know you need backup utility infielders, but man, that’s a huge 68 OPS+ hole getting a ton of ABs. Our opening-day bench of Lombardozzi/Moore/Bernadina/Tracy posted these OPS+ figures in 2012: 82/123/111/111. In 2013? 69/66/43/55. Wow. That’s just a startling drop-off in production. To add insult to injury Kurt Suzuki‘s OPS+ went from a respectable 95 last year to 64 this year. Basically every pinch hitting spot or guy off the bench covering for a starter turned into an 0-4 outing. We know that at least 3 of these 5 bench guys are gone; who will replace them? Dan Haren. $13M for one of the worst starters in the game, even given his little August rebound. The team finished 4 games out of the wild card, 10 games back of Atlanta. 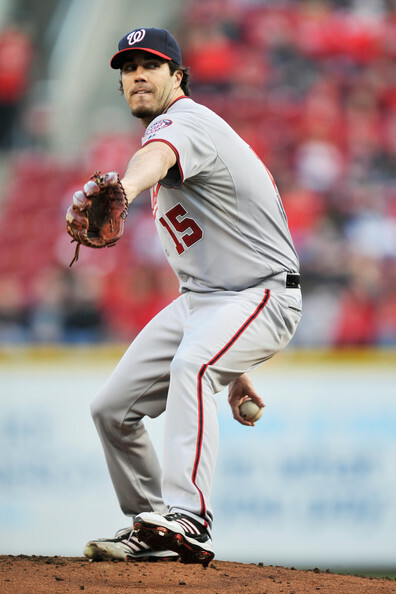 In Dan Haren’s 30 starts, the Nats went 11-19. In every other pitcher’s starts, the team went 75-57. That’s a .568 winning percentage, which equates to 92 wins. Even a #5 starter who gave the team a 50/50 chance of winning on any given sunday would have basically put the team into the WC game. Haren was just a really really poor FA acquisition who contributed a huge part to the downfall of the team. I wonder at this point if the Nats didn’t fail to do the proper medical due diligence on Haren; there was a reason the proposed trade to the Cubs fell through and there was a reason the Angels did not give him a qualifying offer. 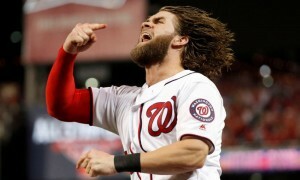 I fully admit: I was completely on board with the signing, thinking we were getting the pre 2012 Haren. Wrong; something clearly changed for him after the 2011 season and I wonder how much longer he can stay in the league after his last two seasons. I’m sure he’ll get another one-year deal for 2014 based on his stronger finish, but another 5+ ERA season may finish him. Offense in general: The team scored 656 runs on the year. That’s down fully 75 runs from last year, when they were 10th in the league in scoring. Had they produced like they did last year in 2013 (about 10th in the league in runs scored and other key indicators), they’d have scored around 700 runs, probably good for at least 10 more wins (under the rough estimate that it takes about 4 “extra” runs per win). With 10 more wins … they’re winning the division again (since some of those added wins come at the hands of Atlanta). Clubhouse Issues: I know that many readers here get irritated with presumptions of “chemistry” issues, writing comments about how we have no idea what really goes on in the clubhouse. Fair enough; we don’t need to rehash the argument. Absent any proof, I believe something might have been amiss. Reporters have noted the losses of free-spirit Morse and the level headed DeRosa. The Soriano acquisition brought a known surly loner with behavior problems into a tight knit bullpen and resulted in the chain reaction demotion of two guys (Storen and Clippard) who didn’t necessarily deserve to be demoted. I believe Harper was fed up with Johnson’s message and was caught on camera more than once clearly ignoring or showing disdain to something he was being told. To say nothing of the ridiculousness of Harper getting hit over and over without any of his teammates getting his back. Can a new manager fix this? Probably. Can a leadership void fix this? Definitely. Perhaps with Jayson Werth‘s great season he can step up in the clubhouse and be the voice of reason moreso than it seems he has been before (either because he was struggling on the field or collapsing under the weight of his contract). Rizzo’s mis-management of the 2013 roster: Rizzo just had to have his speedy leadoff/centerfielder, and Span underperformed when it counted (I’m on record stating over and over that the team is wasting Harper’s defensive capabilities in left and blocking a power-hitter acquisition by sticking with Span in center. But what’s done is done). The opening day roster had no left handed specialists, a move that I quasi-defended at the time but which turned out to be disastrous. We relied on a MLFA (and frankly, we over-relied an incredibly short sample size) for the long man (Duke) and he failed. We had absolutely no starting pitching depth in the high Minors and got rather lucky that Taylor Jordan materialized out of the thin air of high-A and Tanner Roark suddenly added 5 mph to his fastball and turned into an effective MLB hurler. We had a $120M payroll but were depending on bargain basement acquisitions in key roles. That just has to change for 2014. Don’t go looking to save pennies on the proverbial dollar by non-tendering useful guys (as they did with Tom Gorzelanny last year); do the right thing and lock these guys up. 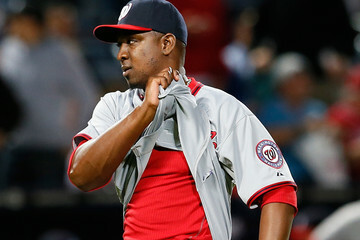 You had enough to waste $30M on Soriano but couldn’t find the scratch to keep around half of 2012’s bullpen? Stl: 0-6, scoring just 8 runs in 6 games. Cincinnati: 4-3 but outscored 36-27 thanks to a 15-0 spanking the 2nd week of the season. When the chips were down, they folded. Especially against Atlanta, who pushed the team around, continually threw at us, and we had no reaction (that is until Strasburg suddenly had a fit of wildness which some will argue was less about standing up for his players and more about being off that day). I lay this at the manager’s feet again. Atlanta has proved time and again (and again) that they’re capable of acting like bullies when it comes to “unwritten rules” of the game, and Johnson let this go unchecked far too long. A new manager with some balls will put an end to this nonesense, fast. Sorry to sound crude, but it is what it is. 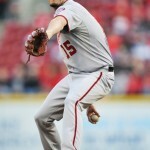 Johnson had no balls and made his entire team look weak in the face of the Braves. Yes its great the team had a run in August and September. What does it really mean? Their schedule was cake in August and then filled with teams with AAA callups in September. Who is the real Denard Span? The guy who hit .235 in the middle of the summer or the guy who hit .303 in September? Can Werth keep this kind of production up in the face of father time in 2014? Can LaRoche return his OPS to something better than what a middling 2nd baseman can produce? Can Harper stop running into walls and stay on the field? I think the scarier part for Nats fans is the fact that this team is basically going to be the exact same team next year. Nearly every position player, likely the entire rotation (simply replace Haren with a healthy Detwiler), most all of the bullpen. There’s not a lot of holes here, not a lot of wiggle room. Unless there’s a major trade on the horizon that drastically reshapes the roster, this is your team in 2014. Can they turn it around and make up the 14 games they declined in the win column? In summary; which of the above points IS the real issue behind 2013’s disaster? And how do you fix it? Because if you don’t address it, then 2014 is going to be the same story.